This page contains news and information about roads and highways in Grayson County, Kentucky. Kentucky Atlas and Gazetteer: Grayson County - Basic geographic and demographic information about the county. Kentucky Transportation Cabinet: District 4 - Based in Elizabethtown, district four serves Breckinridge, Grayson, Green, Hardin, Hart, Larue, Marion, Meade, Nelson, Taylor, and Washington counties. Kentucky Transportation Cabinet: District 4 Planning Projects - Reports and maps from the Division of Planning concerning projects in district 4. Kentucky Transportation Cabinet: Scheduled Public Meetings: District 4 - Schedule of any upcoming public meetings in Grayson County. KY 44 in Bullitt County. KY 88 in Hart and Grayson Counties. Several local residents have requested a guardrail be installed on a hill along KY 259 in Grayson County. Despite fears from some area residents that their homes will soon be torn down, there are currently no plans to build an interchange at the KY 1214 and the Western Kentucky Parkway southeast of Leitchfield. City leaders have requested an interchange to be built; however, it is currently on the unscheduled needs list. The cloverleaf-like interchange on the Western Kentucky Parkway at KY 259 in Grayson County is being rebuilt as a diamond interchange. 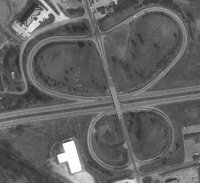 The interchange was the location of the Leitchfield Toll Plaza before tolls were lifted from the parkway. An aerial view of the current interchange.